As well as naval architects we have a sound background in engineering and for example have been among the leaders in the field of design and engineering of lifting/canting keels for over ten years. Owen Clarke consider integrated engineering as one of the keys to a successful project . We carry out such work in-house, but where the project warrants it co-design with top engineering consultants, or contract the work completely to industry leaders such as SP Gurit, Key Design and AES. The illustration above shows a 3D drawing, FEA model and photograph of the installation of a combined lifting and canting keel system for the 65’ Supercruiser, Spirit of Adventure. The conceptual engineering, 3D drafting and final engineering were all carried out in-house. As due diligence, and in order to remove the maximum weight from the system, the keel box design and the solid stainless fin were checked by an external engineering specialist using finite element analysis (FEA). The production and installation of the component was monitored by ourselves from our Auckland office. From small and seemingly insignificant items to major structures, each part is reviewed to ensure its fitness for purpose and the appropriate design and engineering methods are implemented. As often as not a design is taken from a previous project, reviewed and enhanced, or it begins life as a conceptual sketch. From this point the component is either drawn up as a two dimensional CAD drawing, or in the case of more complex, high value or less dimensionally tolerant structures, as a three dimensional solid model. The above example shows the original concept sketch of the rotating bow pole for our open 60 Pindar (ex Hexagon) and the finished product which includes a simple tack lock that we developed for the end of the pole. Owen Clarke Design have recently been nominated and won awards for some of our big boat engineering, including a development of an interceptor trim control system that has been retro-fitted to the 40m Wally superyacht, Angels Share (ex Dream). The system illustrated above was created as a 3D engineering design to fit precisely to the existing transom structure and hull lines with no room for error. The carbon framework and titanium alloy components were manufactured in New Zealand, then shipped and fitted to the yacht towards the end of its refit at Lurssens yard in Germany. Designing custom components ensures all aspects of the project’s design are fully optimised with regard to weight, whilst ensuring the best operational characteristics and of course a long service life. 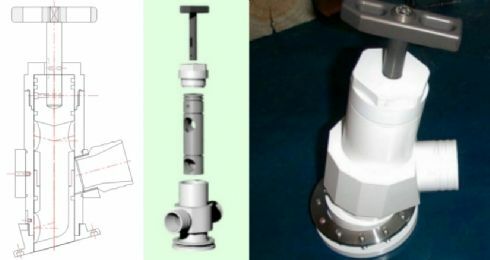 The above illustration shows the original 2D design of a ballast valve and scoop for an open 60 which was custom designed because the off the shelf versions were heavy, resulted in poor (slow) flow and could not be dismantled at sea to clear blockages. The basic valve design was improved such that two tanks fore and aft in the yacht can be filled/emptied using one valve saving the weight of two valves and a number of holes in the boat. The new design was created as a 3D solid model for production purposes and the latest versions have a carbon body. Five different sized valves have now been manufactured for Open 40’, 50’, 60’, Volvo 70 and maxi designs. In common with others items the design is available under licence or we can supply finished and inspected product. We undertake engineering calculations by hand, apply finite element engineering where appropriate and utilise a number of in house programs developed and optimised to provide rapid evaluation of various problems and components. This methodology extends to composite engineering where we offer a full design service from complete boats to components such as rudders and steering systems. Our first engineering project was the 35’ trimaran Fiery Cross designed in 1987 which we completed in its entirety and we are conversant with the engineering of carbon/glass foam, honeycomb and cedar cored structures. As well as engineering some of our own Mini Transat and Class 40 designs we have also undertaken the engineering of rudders and other components for cruising and racing yachts from other design offices. 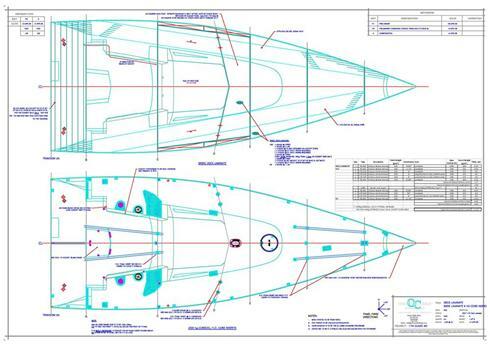 For grand prix projects we maintain a close involvement with the general engineering design of the yacht but sub-contract out the major composite engineering and some of the construction drawings. As in the other areas of our work we continually push the limits of design in order to improve both performance and reliability. For our latest Open 60 as well as sub-contracting the composite engineering we contracted SP Gurit to undertake an FEA analysis of the global hull and deck structure and an in-depth analysis of the keel, ram and mast step engineering.